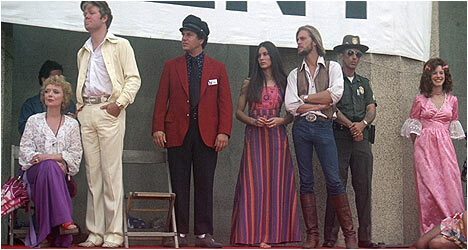 At the time, Nashville (1975) was Robert Altman’s magnum opus, a sprawling tale featuring 24 characters over five days. Not only does he manage to juggle all of these storylines, but is able to seamlessly interconnect them in major or minor ways. The end result was an unflinching look at America through Altman’s eyes – a kaleidoscope approach that he helped pioneer and that flew in the face of conventional Hollywood filmmaking, but could only have been pushed through the system during the 1970s. Altman’s playful, freewheeling style is evident right from the get-go as the cast is introduced via a faux television ad for a greatest hits record collection. Then, he proceeds to immerse us in the lives of several characters, presenting them in a non-judgmental way as if he was anthropologist of American culture. Nashville is a cross-section examination of the city’s country music scene, from its royalty, like elder statesman Haven Hamilton (Gibson) and Barbara Jean (Blakley), to its aspiring up-and-comers, like Sueleen Gay. We also meet various sycophants that orbit these people, as well as musicians, like Tom Frank (Carradine), that exist on the fringes. The ubiquitous van blasting presidential hopeful Hal Phillip Walker’s political beliefs and Jeff Goldblum’s amateur magician riding around on a chopper provides the connecting tissue that binds all of these characters. As he’s so good at doing, Altman captures key private and public moments of these characters, which provides crucial insights in scene-sized chunks that require the viewer to pay close attention because there are so many people to keep track of. Many of these characters are so fascinating in their own right that they could easily star in their own film and, at times, it feels like certain scenes could be jumping off points for potential spin-off films. It goes without saying that the cast is uniformly excellent with the likes of Keith Carradine playing a selfish folk singer, Lily Tomlin as a middle-class housewife with two deaf children, and Ronee Blakley as a famous country singer standing out in particular. Also of note are Jeff Goldblum and Shelley Duvall making quite an impression in minor roles as eccentric oddballs. It doesn’t hurt that these actors get to work from Joan Tewkesbury’s brilliant screenplay and are directed by actor-friendly Altman. To the uninitiated, his mosaic approach may seem scattered and unfocused, but he’s juxtaposing intimate moments with big splashy scenes to provide fascinating slices of life. You don’t have to appreciate country music to enjoy Nashville. You just need to be drawn to interesting characters and human behavior of which this film has in abundance. Altman had a great run during the ‘70s and this definitely one of his best films from this period if not his entire career. This new Blu-Ray transfer of Nashville looks fantastic. The folks at Criterion should be commended for the excellent work on this print, which has incredible detail while still retaining its filmic look. Ported over from the Paramount DVD is an audio commentary by director Robert Altman. He points out that the cast wrote most of the songs for their respective characters. All of the songs were done in-house and when Nashville came out, local musicians hated them. He mentions the numerous collaborators he worked with in front of and behind the camera and explains what they contributed to the film. Altman talks about his approach to filmmaking on this engaging and informative track. Also included is a fantastic theatrical trailer. “The Making of Nashville” features various cast and crew members recounting their roles in this film and what they think of it now. They talk about getting involved in the project and their impressions of Altman. The likes of Keith Carradine, Lily Tomlin and Michael Murphy (among several others) tell fantastic filming anecdotes and address Altman’s famous habit of encouraging improvisation among the cast. “Robert Altman’s Interviews” include one from 1975 when Nashville was released and he talks about the film’s origins and how hard it was to get made. There’s another from 2000 where he talks about various cast members and their characters. The third one is from 2002 and Altman points out how Nashville was the first big film where he had complete creative control. There is “Behind the Scenes” footage of the opening traffic jam scene and the final one. It’s pretty grainy and has no sound, but does provide a glimpse into Altman’s working methods. Finally, there is “Keith Carradine Demo.” Altman recorded three songs that the actor created fro the film in his office and you can listen to each one.